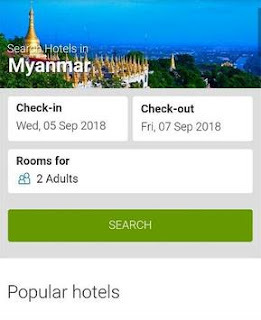 Booking Myanmar Hotels - BookingAHotel.com is an easy way for you to search and make hotel bookings in Myanmar (Burma). Whether you are travelling for business or leisure, this mobile application is the best way for you to choose a suitable hotel or inn. Make your hotel reservation and travel planning hassle free with this app. There is also a list of the top attractions in Myanmar for your reference! Using this app, you can see popular accommodation types for the area you are going to. There is a wide range of hotels, including five-star international chains and small local inns. You may filter and sort hotels based on their star rating, and book hotel rooms for big groups or individuals just like on bookingahotel.com. You can also make changes to your reservation dates, and look for last minute deals if you are in a rush. Most people would go to the usual hotel booking websites like on bookingahotel.com. It may seem troublesome having to book hotel rooms at different areas and dates. Using this app though, you could easily search for and book rooms based on the area and date of travel. 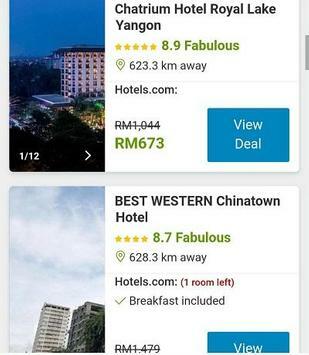 Business executives, backpackers, families on holiday in Myanmar, visitors to conventions and exhibitions, frequent travellers in transit – basically anyone who needs to book a hotel or hostel. After opening the app, select “Book Hotels (Hotel Reservations)”. Choose your travel dates, number of guests and destination. Make sure to check all details of your preferred room, including airport shuttles, hotel breakfast, Internet access, free cancellations etc. Then go ahead and book the room! The Booking Myanmar Hotels app uses an index that is collated from all the major hotel booking websites. You can read what other travellers have commented about the hotels in your chosen area. Myanmar is a big country with many places of interest and hotels of all kinds, in cities like Yangon and Mandalay. Even in the outskirt areas, you can usually find inns and hotels for your accommodation. If you have done hotel bookings such as on hotelstostay.com you may have come across backpacker hostels and homestay lodges. They may not accept foreign currency or certain cards, so be sure to get Myanmar Kyat (MMK) while you’re in the city. Hotel reservations should be done early if you want a good deal, or if you’re travelling during holiday season. We hope you have an enjoyable stay in Myanmar!